In 1801, it seemed as if Britain had made the entire world her enemy. Her allies had dropped by the wayside, Spain had swapped sides and allied with France, Austria was defeated, and Russia, under Tsar Paul, schemed to divide Europe between itself and France. Three coalitions formed against Republican France had already collapsed, leaving Britain friendless and alone. Yet, Britain fought on, alone. Britain relied heavily on naval stores, which came out of the Baltic; supplies such as fir trees for masts and spars, hemp for cordage, and tar and pitch. 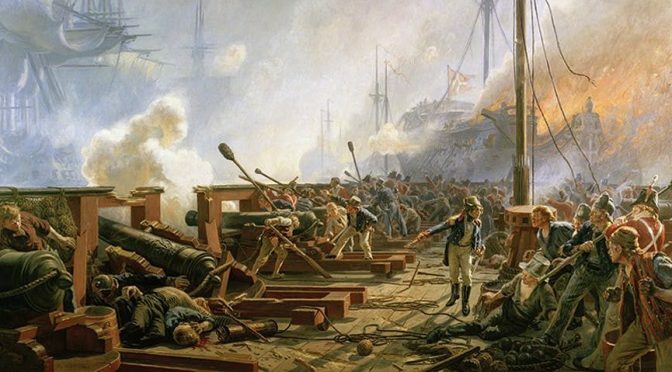 As the French revolutionary armies swept across Europe, borders changed and the number of ports Britain had to blockade increased, stretching the Royal Navy to the limit and further increasing the requirement for Baltic naval stores. Merchants from overrun nations transferred their cargos and vessels to neutral flags, such as Denmark and Sweden. As a result of this, the merchant marines significantly increased after the wars broke out in 1793. Many of the ships carried legitimate cargos, but some carried contraband. However, to a nation fighting for its life, all goods going into an enemy port could be constituted a threat. As the struggle at sea intensified toward the end of the 1790s, the need for the Danes to protect their convoys from privateers, as well as the Barbary pirates, increased. Convoys escorted by Danish warships involved themselves in several naval skirmishes with British blockading squadrons in 1798, 1799, and 1800. These skirmishes resulted in the British seizing Danish convoys. 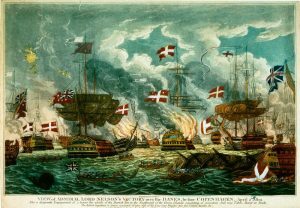 The seizures led the Danes toward reviving the old League of Armed Neutrality, which had last formed in 1780 to protect the Baltic Nations’ ships during the American Revolution and to protect merchant vessels from belligerent privateers. Tsar Paul was happy to help revive the League. He had recently fallen out with the British over the island of Malta. The Swedes and Prussians also joined the League. The formation of the League was a threat to British security. Britain’s fleet protected the island from invasion. Anything that jeopardized her access to Baltic naval stores was a threat. Therefore, a Baltic coalition formed around a hostile Russia could only be interpreted as a threat. His Majesty’s government decided that the best way to disrupt the League was by striking out at the weakest link in the Alliance. Britain demanded Denmark leave the League. When she refused, Britain prepared a fleet to remove Denmark from the League by force. As Britain’s allies were defeated and dropped out of the conflict, Britain’s struggle for naval supremacy began to yield results. The battles of Cape St. Vincent in 1797 and Aboukir Bay in 1798 had defeated the Spanish and French navies and left them to regroup and refit. Britain controlled the seas. With naval superiority, Britain could blockade French ports and enforce restrictions on neutral ships. Some ships flew Danish flags as a convenience. The registration and flag were from Denmark, but little else was Danish. In reality, many were former Dutch merchant ships with Dutch cargos and crews.1 This was especially prevalent amongst the “Danish” ships bound to and from the Dutch East Indies. In 1797, 1798, and 1800 British ships sighted Danish Convoys and compelled them to heave-to. However, the Danish escorts refused to allow the British frigates to search the convoy for contraband goods. On July 25, 1800, the British frigates Nemesis, Terpsichore, La Prevoyant, and Arrow – all of 40 guns – and Nile – a small lugger – found the Danish frigate Freya escorting a convoy of six ships. Captain Baker of the Nemesis sent a boat to the convoy to search for contraband, however, the Danish Commander replied, “that if he attempted it he would fire into the boat.” Captain Baker lowered his boat and the Freya opened fire on the boat, missed it, and struck the Nemesis killing one of her crew. With this, the Nemesis gave the Freya a broadside, and “a most spirited action took place, which lasted for about twenty-five minutes, at the end of which time the Danish frigate, being much crippled in her masts, rigging, and hull struck her colours.” The British ships escorted the Freya and her convoy into the Downs to await the adjudication of a prize court. Regulations set down in 1673 stated, “When any ship met withal by the Royal Navy, or other ship commissioned, shall fight or make resistance, the said ships and goods shall be adjudged lawful prizes.” The prize court ruled that, “free ships make free goods,” but only to a certain extent, and that belligerent powers do have the right to “[ascertain] whether the ships are free or not.” Many Englishmen thought that the Danes and the Swedes were aligning themselves with the French by going out of their way to force engagements with the British over the convoy. The British insisted that the privilege “of visiting and searching merchant ships on the high seas, whatever be the cargoes, whatever be the destinations, is an incontestable right of the lawful commissioned cruiser of a belligerent nation.”2 The British had to insist on this steadfastly, otherwise, their entire blockade of France and her satellite republics would have been futile. Food, weapons, and supplies for her army would find their way into French ports in Danish and Swedish bottoms. If the French and Dutch received the naval stores that the British blockade denied them, then the Franco-Dutch fleets could come out and fight the British fleet, possibly defeating them and invading England. The British viewed this armed League arrayed against them and proceeded to neutralize the Northern League’s threat. William Pitt, the Prime Minister, remembered what had happened when his predecessor, Lord North, failed to neutralize the threat of the League in 1780 – his government had fallen in 1782. The Dutch, Swedes, Danes, and Russians managed to form their convoys and protect their freedom to sell naval stores to Holland, France, and Spain. As a result, the British met well equipped Dutch, Spanish, and French fleets across the world, from Jutland to Ceylon. 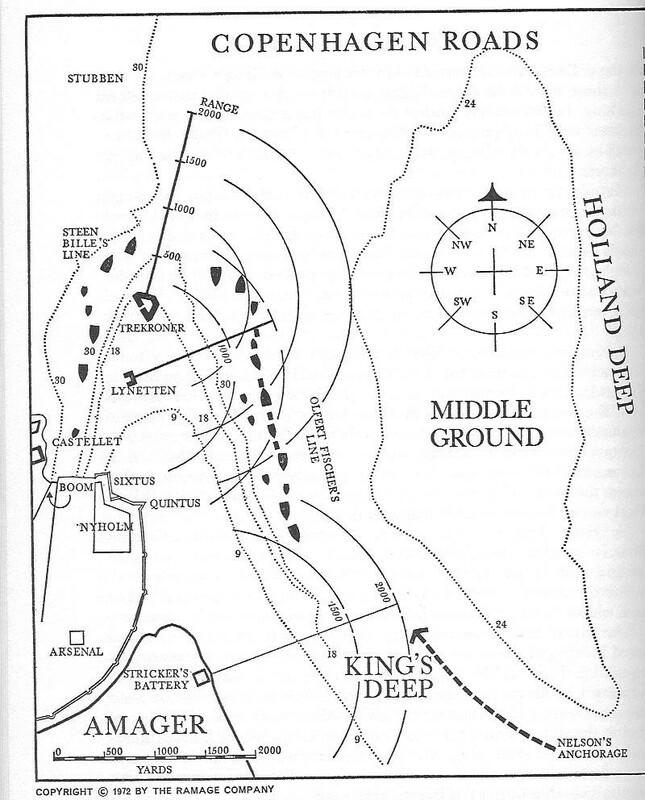 At the Dogger Bank in August, 1781, the British and Dutch fought an indecisive, but bloody battle. 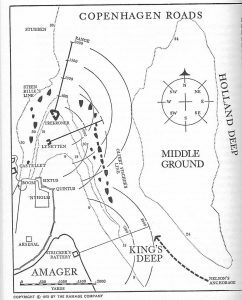 The seven Dutch ships remained in line, but the British fleet of seven ships of the line bore down on the Dutch and crossed through their line. However, Admiral Hyde Parker’s fleet failed to break the Dutch line. Admiral Parker could not reform his ships into line and the engagement ended.4 To prevent a repeat of the 1780 League, British national security demanded the dissolution of the 1800 League of Armed Neutrality by whatever means necessary. The prevention of French control from Archangel to Venice was precisely the reason why Britain had to act against the Armed Neutrality. “Free ships with free goods” would accomplish nothing except enabling the French economy through neutral shipping. In hindsight, it is easier to say this than it would have been to act upon such notions in 1801. Nevertheless, the only way to disarm the Northern League was by force of arms. Most reports of the day said that it would require only twenty British sail of the line to blockade the Baltic Sea. By blocking the passage out of the sound, the League would be forced to come to terms with Britain, for lack of any way to trade with the world. Alternatively, a bold admiral could destroy the Danish, Swedish, and then Russian fleets piecemeal, as was the original plan of Lord St. Vincent and Lord Nelson. Tsar Paul resented the British occupation of Malta. Tsar Paul’s Francophile tendencies combined with Malta’s strategic location meant that they were reluctant to surrender the island to Russia. Especially since it would give Russia a warm water port in the center of the Mediterranean at the very moment Russia negotiated with the French. The British decided the easiest way to destroy the Northern League was to remove the weakest link. Denmark was that link. Denmark was fearful for her dominions: the Duchies of Schleswig, Holstein, as well as Norway. Sweden schemed constantly to seize Norway, while Prussia or France could easily snap up Schleswig and Holstein, or the whole of the Jutland Peninsula. Count Bernstorff was in a difficult position. He had to decide which threat was more dangerous: the Russian threat, which could result in the loss of Schleswig, Holstein, and Norway, along with the cities of Lübeck, Altona, and Hamburg or the British threat, a threat which was not yet ready, and could possibly be avoided through diplomacy. Count Bernstorff decided that the British were the lesser threat. Count Bernstorff demonstrated Denmark’s fealty and loyalty to the Coalition with a hard line stance against the British. Count Bernstorff did not believe that Britain would fight a friendly power, and Denmark had historically been a friendly power. As a small maritime power, and gatekeepers of the Baltic, the Danish have always been very cordial with the English. Bernstorff was gambling that this international amity would prevent an English assault. The Danish government also believed their own propaganda that the batteries at Kronborg Castle could prevent any ship from entering into the sound. With the British fleet anchored nearby, Danish leaders still considered Russia as a greater threat than the British because of Prime Minister William Pitt’s resignation. However, Pitt’s resignation was due solely to domestic considerations and not foreign policy. Pitt had resigned because the King refused to grant Irish Catholics emancipation and allow them to hold government offices. Many foreign officials misinterpreted this domestic issue as a collapse of the British war party, and that the British people, weary of war, were going to make a peace with France. This was not the case. Pitt’s supporters formed a new British government and intended to carry the war to its rightful end: the destruction of the French republic, and the removal of Bonaparte.8 While diplomatic efforts stalled, the British fleet prepared to neutralize Denmark, by diplomacy if possible, and force if necessary. While diplomacy withered, both sides looked to their arms. Admiral Hyde Parker, the hero of Dogger Bank, commanded the expedition. His deputy was Admiral Lord Nelson, Duke of Bronte. Admiral Parker was expected to be the calm, diplomatic officer in the hopes that the Danes would seek a diplomatic solution. In case that failed, Admiral Nelson was the energetic, dashing admiral expected to chastise the Danes into submission. The Danish defenses were commanded in person by the Crown Prince, and at sea by Commodore Olfert Fischer and Captain Steen Bille. The British fleet composed 19 ships of the line, including two 98 gun second raters along with seven frigates and 23 smaller vessels. The Danes opposed this force with about 30 ships of various sizes moored in line to protect the city of Copenhagen, supported by the Trekroner Fort.9 Before the battle, Diplomat Johan Georg Rist regarded the defense of the sound as another Thermopylae saying, “viel Ehre, mit wenig Hoffnung” or “much honour with little hope.”10 As a member of the Danish Government, his opinion demonstrated how greatly the British had underestimated the Danes, who would rather fight a losing war than turn their backs on their allies. Copenhagen lies on the island of Zealand, and partially on the tiny island of Amager. Copenhagen Roads, the easiest and most obvious route for an attack, is to the northeast of the entrance to the harbor. To the east of the island, about 2,500 yards from the island of Amager, and about 2,000 yards from the Trekroner Fort, lies the Middle Ground, a large shoal that splits Holland Deep from the King’s Deep and the entrance to the port of Copenhagen. The British fleet outnumbered the Danish fleet 262 guns to 150 guns. Nelson’s plan was for his ships to approach the enemy ships, bombard them into submission, and then reduce the Trekronner Fort. Nelson’s advantage in guns was matched by the maneuverability of his fleet fighting against a moored fleet, unable to maneuver. Yet, there were two factors that could make or break Nelson’s plan: wind and water depth. For success, Nelson needed the wind out of the south and water depth sufficient for his fleet to approach the Danish fleet. Throughout the night of April 1st, the wind veered into the south, promising victory on the 2nd. The British fleet could only sound the waters outside of Danish cannon shot. This left plenty of space for ships to run aground. The British Baltic Sea pilots that the fleet had brought with them refused to risk their necks or the ships on the uncharted waters. Instead, Sailing Master Alexander Briarly, of Audacious, volunteered to take responsibility and lead the fleet towards the Danes. Master Briarly had done the same at the battle of the Nile.13 Several British ships of the line ran aground on the Middle Ground Shoal. Nine of the 12 ships of the line were available to Nelson, but the fleet’s pilots refused to come within 300 yards of the Danish line for fear of the Refshale Shoal which was thought to be near the Danish fleet. Instead, the British would fight from 600 yards. Battle of Copenhagen. Nelson holding the telescope to his blind eye. April 1801. The Danes and Nelson sat down to negotiate an armistice. Because Denmark could not leave the Armed Neutrality, she would halt all military preparations for fourteen weeks and the British would not come within cannon shot of Copenhagen’s fortifications. News that Tsar Paul had been murdered, and that the new Tsar Alexander favored the British and disliked the French, meant that the Armed Neutrality ceased to exist. The neutralization of Denmark, combined with lack of Russian hostility to the British meant there was little to organize over. Tsar Alexander had renounced all claims to Malta and was ending the embargo against British ships. The Swedish fleet never left Karlskrona; it would certainly have met with defeat at the hands of the British fleet commanded by Lord Nelson. In Egypt, General Abercrombie had decisively defeated the French army, although he paid for his victory with his life. His army had ended French occupation of Egypt. Britain thought it was in a position to make peace with France on equitable terms and not from a position of weakness. However, that peace proved to be elusive; the people of Europe had to wait another 13 years after the Peace of Amiens for lasting peace to come. In 1800, the British took the lesson of 1780 to mind and met the Armed Neutrality head on. Through luck, skill, and the determination of the British Sailor, she defeated it. Anderson, R.C. Naval Wars in the Baltic. London: Francis Edwards, First Pritning 1910, Second Printing 1969. Cable, James. The Political Influence of Naval Forces in History. New York: St Martins Press, 1998. Feldbaek, Ole. Denmark and the Armed Neutrality 1800-1801: Small Power Policy in a World War. Copenhagen: Akademisk Forlag, 1980. Harding, Richard. Sea Power and Naval Warfare: 1650-1830. Annapolis: Naval Institute Press, 1999. Kennedy, Paul. The Rise and Fall of British Naval Mastery. New York: Charles Scribner’s Sons Press, 1976. Lavery, Brian. 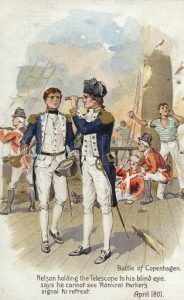 Nelson’s Navy: The Ships, Men, and Organisation 1793-1815. Annapolis: Naval Institute Press, 2000. Pope, Dudley. The Great Gamble: Nelson at Copenhagen. New York: Simon and Schuster, 1972. Tracy, Nicholas. The Naval Chronicle: The Contemporary Record of the Royal Navy at War 1799-1804, Volume II. London: Chatham, 1998.